Polished Horizontal Aluminum Billet Main Grille (N85422A) by APG® fits 2004-2007 Nissan Armada and 2004-2007 Nissan Titan trucks. The Grille is made of aluminum for high durability and is designed application-specific to fit your vehicle perfectly. Grille Type: Replacement (Cutting Required). Designed application-specific to fit your vehicle perfectly, the billet grille is built from solid 1/2" billet of aircraft grade 6061-T6 aluminum that is one of the toughest and lightest materials. The aluminum is widely used in production of the billet grilles since the aluminum is well-known for its high strength, durability and corrosion resistance. The aluminum billet grille is available in mirror-like polishing or black powder coated (for most applications) to enhance the exterior styling of your vehicle. 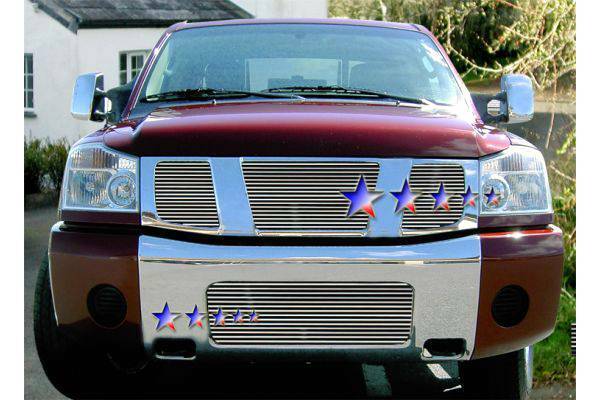 The billet grille is easy to install. All necessary hardware is enclosed and user-friendly instructions help to carry out installation properly.